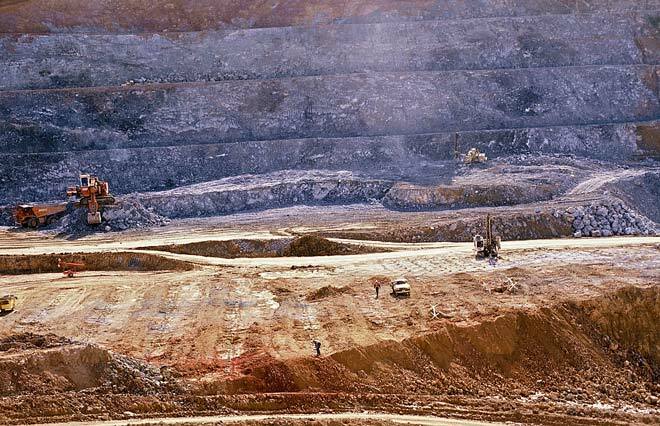 The Martha mine at Waihī, photographed in 1991, is an example of an opencast hard-rock gold mine. These mines operated like quarries, with terraced faces stepping down to the bottom of a pit. A drill rig (right) is drilling holes which will be plugged with explosives and blasted. The shattered rock is then loaded by huge diggers into massive dump trucks and taken to mills for crushing and processing.